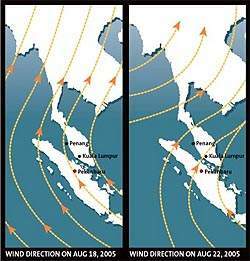 Malaysia’s Meteorological Services Department warns that the haze might return on Monday due to the predicted change in wind direction. On the left is the wind direction on Thursday, and on the right is the predicted wind direction on August 22nd (Monday). The new wind direction will most definitely bring the haze back on Monday unless the fires are put out before then. â€œWe are working with the Indonesian Government on the project. Malaysia will bear the expenses while Indonesia will allow us to use its airspace,â€ he told a press conference yesterday. Wow. What a fair trade-off. It rained heavily yesterday in Riau, one of the areas with the most hot zones in Sumatra. Indonesia’s Meteorology and Geophysics Agency also stated that satellite photos of large vapour clouds showed the possibility of heavy rain today (Sunday).